Orchids have always appeared a little illusive to me. Tricky and unpredictable would be the best way to describe how I felt about them. They just seemed like a plant that other people grew and not me.I grew up in a small country town and I remember hearing about the Orchid Society and the Annual Orchid show. I remember one day driving past the hall where the Orchid Show was taking place and I looked in and it was a mass of colour and what appeared to be very excited people – chattering about their prized orchids. I just couldn’t imagine standing around talking about ‘orchids’ all day. Now I find myself in a completely new space, where each morning I look out of my kitchen window to will my little orchid cuttings on to success and abundant flowering – I’m sure this works! My own fascination with orchids started when I visited my childhood home a few years ago. I discovered, or finally opened my eyes to the strategically placed orchids in the garden, on and around trees and on the veranda and deck. There in all their glory were Rock Orchids (Dendrobium speciosum –I’ll talk about these another time), the most beautiful pots of Crucifix Orchids (Epidendrum spp.) and I’m sure that other species were hidden there to! The Crucifix Orchids were flowering prolifically in orange, red and purple. The pots that the orchids are planted in have been placed in terracotta coloured pots and they look perfect on the north facing veranda. These beautiful plants kept on flowering over the years until recently when I was ‘home’ and discovered only one flower left. Nothing to worry about, they just needed re-potting and a little prune. 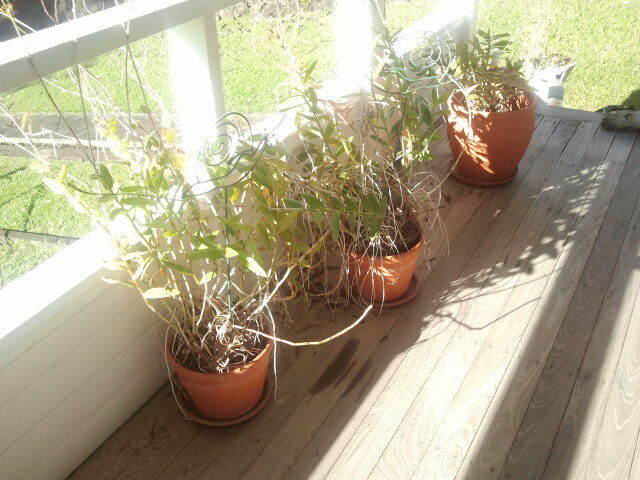 The Crucifix Orchids on the veranda. When they were flowering they were so beautiful, but even like this they look wonderful with their green leathery leaves. So I got to work pruning. The re-potting will have to wait for another visit (hopefully not too far away!). As I mentioned, most of the old canes had finished flowering, but it was at the stage where they were starting to reshoot (up the length of the cane new leaves were starting to grow). I discovered this after I had cut some out, but it didn’t matter because the canes still needed to be removed to make the plant look tidy and to reduce the amount of energy that the plant was putting into these old canes. I want the plant to now put energy into healthy growth of the remaining canes and into producing beautiful, abundant flowers. Without intending to I had collected for myself a number of cuttings, some were the canes with leaves, others were new growth with aerial root (roots that survive without being in the soil). I decided then that I would try my hand at propagating them to produce beautiful plants with fabulous flowers in my own garden. 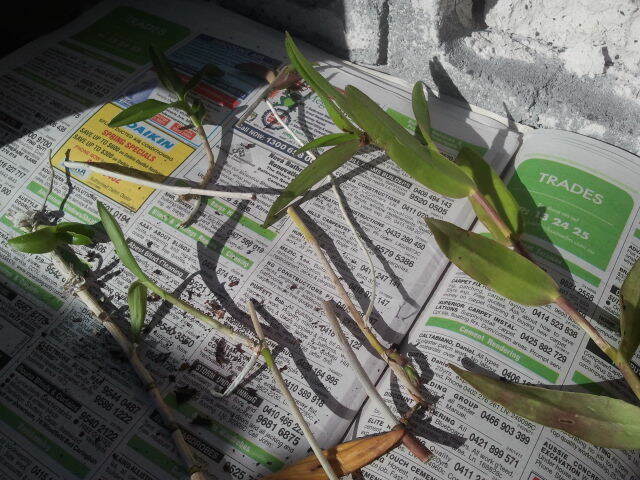 An arrangment of orchid cuttings, surely at least one will take. I’m hopeful. So, I set to work. First I purchased some orchid potting mix. 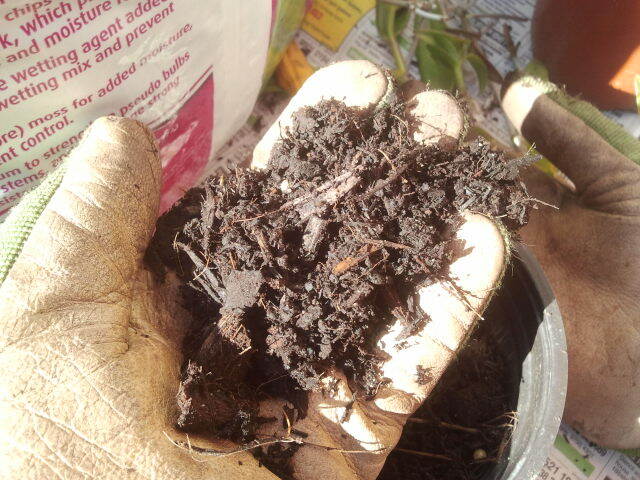 Orchid potting mix is course and allows water to drain freely through and out the bottom of the pot. It also provides the orchid with the correct trace elements or minerals for healthy, strong growth. 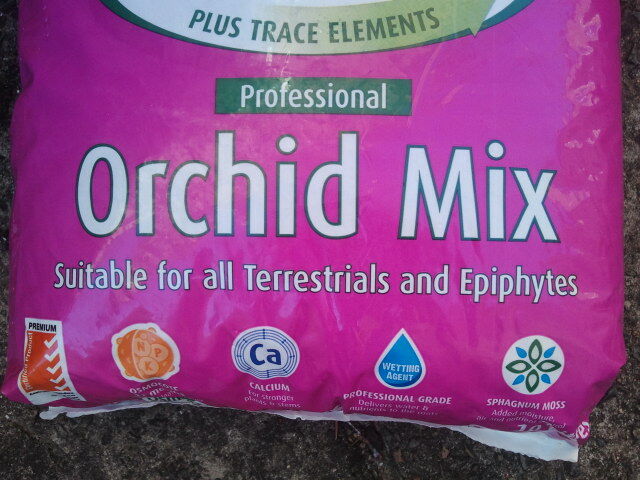 As long as it says Orchid Mix on the bag you can be assured it is good for all orchids- course, free draining and contains the correct balance of trace elements. You can see all of the goodness that makes this mix ideal for growing orchids. Next I tidied up the cuttings a little then planted them. Because I am new to this I decided to experiment with the cuttings, using all the different ones I had to see which one will take best. I used old pots because they were small and wouldn’t take up too much room and as I found out once finished, they fit perfectly on my kitchen and office windowsill. So now I can look at, talk too and encourage them to become healthy, mature, beautiful looking plants through the day. Old nursery pots are ideal for this use. Any size will do. 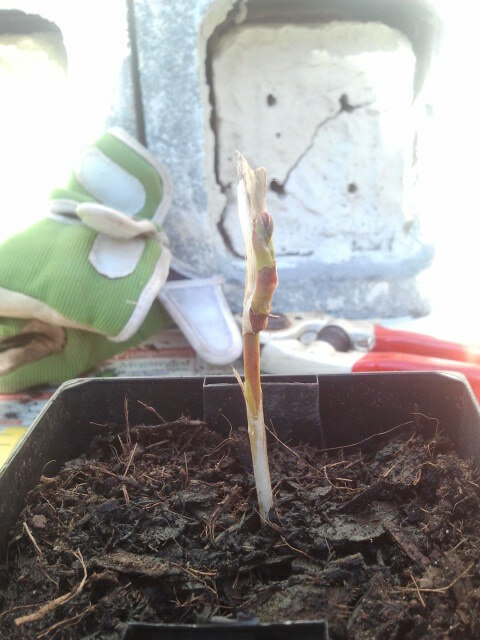 One of my little cuttings planted and ready to grow and blossum. This gorgeous little cutting consists of a flower spike. I’m not sure how this one will go but I will encourage it on to good health and strength. 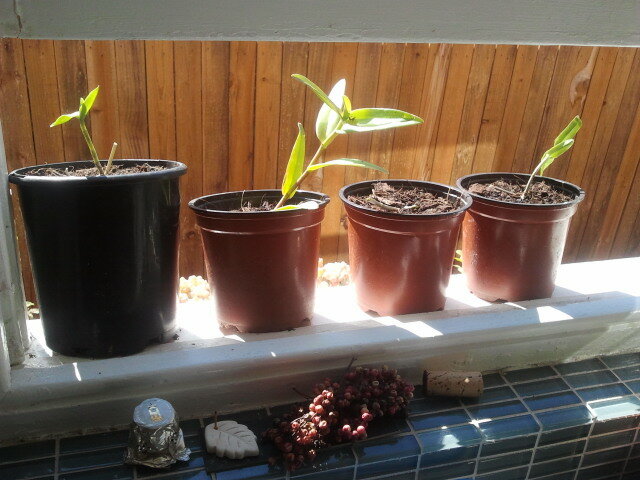 Four of my pots on the kitchen windowsill where I can will them to become healthy, mature beautiful looking plants. Ideally I would have liked to propogated these orchids in warmer weather but as it turned out the opportunity presented itself to me now, in late autumn. 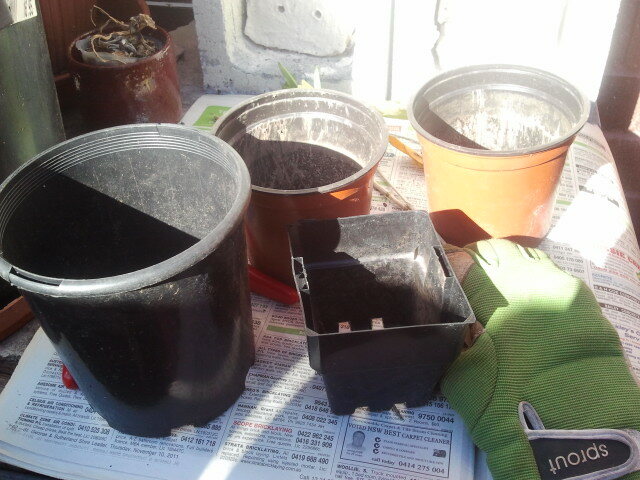 So having said that I will be patient and nurturing to my new little plants and continue to encourage them. If these cuttings don’t take I know where I can get more from and hopefully I wont have to bring them back to Sydney stuffed in my luggage on a plane. If you have any nice orchid growing stories please share them here, we’d love to read about them. 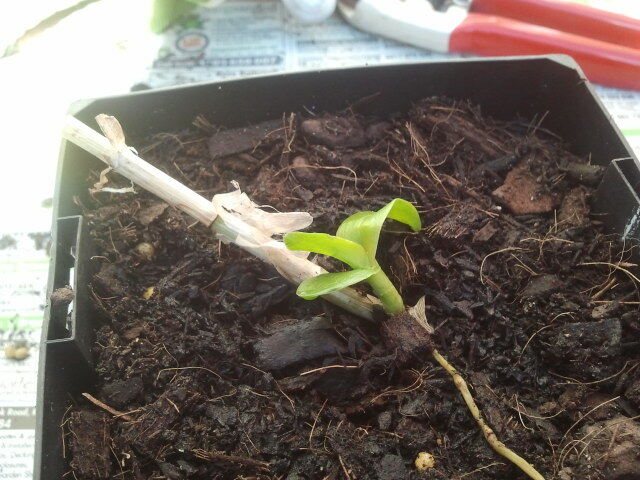 Fingers crossed for hte orchid survival! Keep us posted.